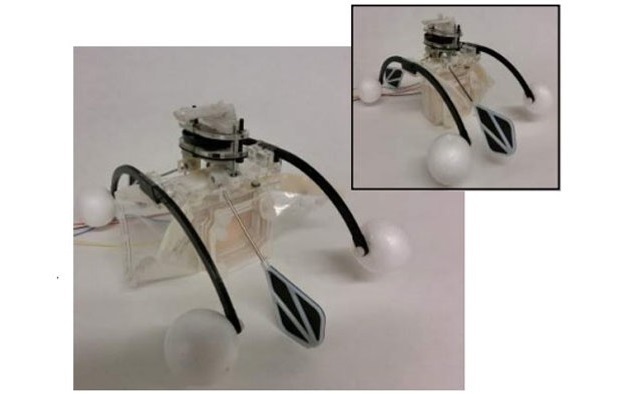 Inspired by the water boatman bug, a team at the University of Bristol has created the Row-bot, a robot prototype that is designed to punt itself across the top of the water in dirty ponds or lakes, and "eat" the microbes it scoops up. It then breaks these down in its artificial stomach to create energy to power itself. In this way, it generates enough power to continuously impel itself about to seek out more bacteria to feed upon. 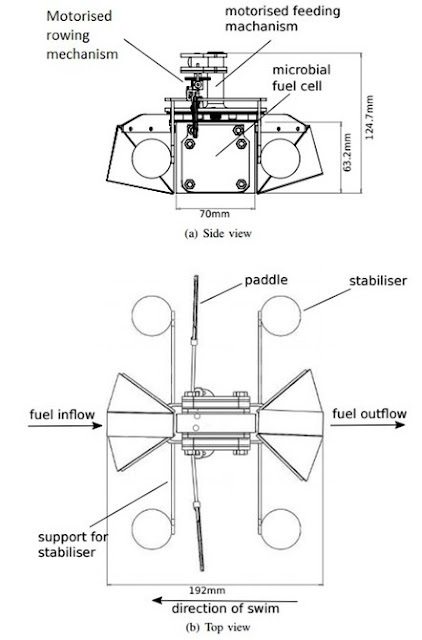 The Row-bot consists of two main elements a propulsion mechanism to move the Row-bot around using a paddle operated by a minuscule 0.75 Watt, brushed DC motor, and its "stomach," where a microbial fuel cell (MFC) supplies the electric current to the motor powering the paddle. The whole system works when the robot ingests some water, with the MFC creating electricity from the bacteria contained within it, which allows it to make a few strokes of its paddle. This movement then lets Row-bot take in more dirty water, and the process starts all over again. This is what sets the Row-bot apart from other similar miniature swimming robots (such as Harvard Microrobotics' Robobee); it is completely powered from the medium in which it swims. The water boatman insect that Row-bot emulates has legs covered by hairs to maximize surface area during the power stroke and which collapse to minimize drag during the recovery stroke. So, too, the design of the Row-bot's paddles alter to maximize efficiency. Constructed from a 3D-printed composite structure with a rigid frame supporting an elastic membrane, each paddle is stretched out to increase the paddle surface area during the power stroke. The membrane has a hinge that changes the angle of attack on the part of the paddle that remains underwater during the recovery stroke to reduce its frontal area and, therefore, its drag. 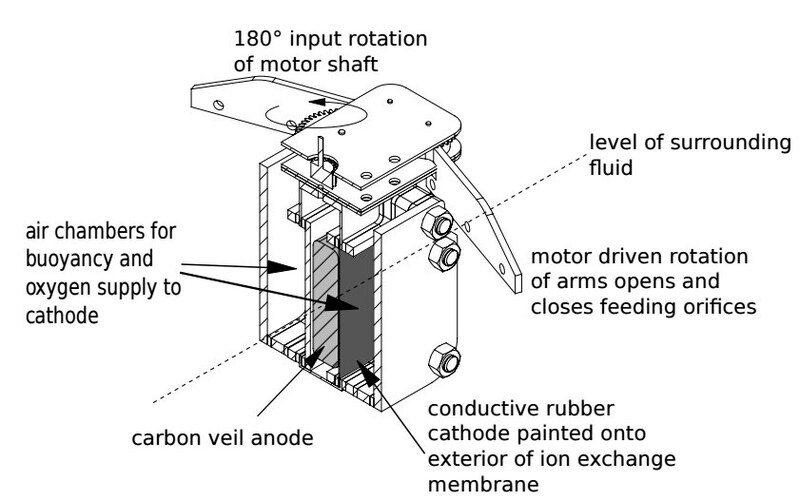 The MFC – like the one developed by UWE Bristol to generate electric current from urine used in the Row-bot is similar to a normal fuel cell, except that in place of more common fuels to power the process, it uses bacteria to create an electrical current by mimicking bacterial interactions found in nature. When micro-organisms are fed sugar in aerobic conditions (that is, in the presence of oxygen), they produce carbon dioxide and water. However, in anaerobic states (when oxygen is not present) in a MFC, they produce carbon dioxide, protons, and electrons. In this way, an electric current can be created between two electrodes to produce electricity. The researchers believe that the device has the potential for many uses as an energetically autonomous robot, including in remote sensing and environmental monitoring and clean-up. In this vein, the next stage planned for Row-bot is the integration of monitoring and control subsystems, along with some additional switching circuitry all powered by the MFC. The results of this research were recently presented in a paper at the 2015 IEEE/RSJ International Conference on Intelligent Robots and Systems (IROS) in Hamburg, Germany.